We have two convenient locations with six Chiropractors, Physical Therapy, Massage Therapy, Acupuncture, and Personal Training. This enables us to provide you with a Collaborative Spine Care approach that fits your specific needs. Our Brighton office is conveniently located at 30 Allens Creek Road near the corner of Monroe Avenue. You can easily locate our office with our unique entrance and exit signs. Our Webster Office is located at 488 Plank Road near the corner of Empire Boulevard. 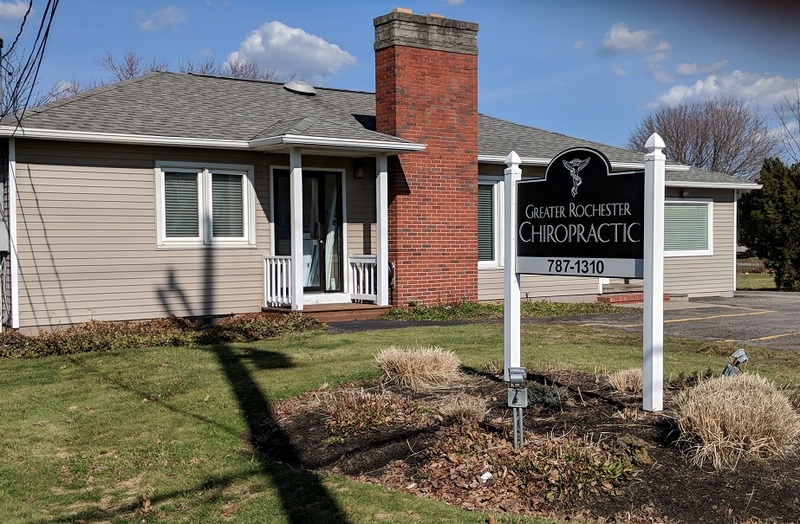 Greater Rochester Chiropractic is your source for Collaborative Spine Care. Our practice is unique because we can provide you with Chiropractic Care, Physical Therapy, Massage Therapy, Acupuncture and Personal Training at our main location in Brighton. Every patient's condition has specific needs. Our collaborative approach enables us to design a treatment program that best addresses the cause of your problem. We have 2 office locations. Visit our Brighton or Webster Office. Download patient forms for your convenience. Dr. Amy Kochersberger is wonderful! She works with our family of 5 including 3 children ages 6, 4, 3. She takes the time to understand what we might be struggling with and is always willing to take the time to answer any questions I have. She is incredibly patient with my 3 children as we attend monthly visits with her and they are all seen at the same time. Scheduling has been very easy and I have been able to get scheduled for last minute appointments when needed. Friendly caring staff. Check in is amazingly fast. Dr. Quatro has been the best chiropractor I've see. He is on spot with his treatment of both my neck and back issues. Highly, HIGHLY recommend. 5 star first class care from the moment I walked in the door. I immediately trusted Dr. Lange's care, from the moment I met him. He remains my first choice for care. Dr. Tuzzo has been great . My whole family has seen her and we all have had a great experience. She’s very kind,knowledgeable and very gentle with our one month old son . Dr. Tuzzo did my post partum care as well and I feel so much better as well as my one month old and husband. We will continue to visit the office for our chiropractic care. Dr.Swinton is amazing. First time ever to a chiropractor and I felt relief after. Went back for my second visit and I can start to feel a difference in my back already!!! Dr. Quatro really helped me when I injured my neck. I could barely move it and within a few days I am almost back to normal! As always I was greeted pleasantly upon arrival and given my room assignment in a very timely manner. Dr. Lange was his usual, congenial self and addressed any concerns that I might have. Checkout was quick and easy. Overall the visit went very well as has been my experience with Dr. Lange for nearly 20 years. Doctor Jason is the best!! For the first time in years I stood all day giving presentations and my back doesn’t hurt!!! Thank you!! I immediately felt comfortable in Dr. Tuzzo's hands. She is so knowledgeable and confident in what she does- AND I feel great!